Last month I got an email from one of the auction sites about an auction ending that day and decided to take a look. 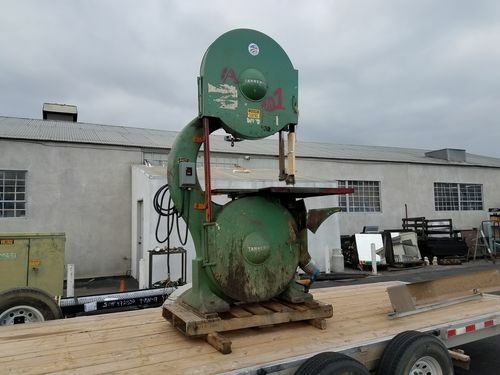 Well, one bandsaw in particular caught my eye. Looked in decent shape and no one was really bidding on it. The price was just too low to pass up. It’s a Tannewitz GH 36”. The problem was I was going on vacation the next week so had no way to pick it up if I won. I was able to get with the guy who does the loading and he offered to take it to his shop and hold it until I got back. Well, sure enough I won with my first bid and picked it up a couple weeks ago. Here’s the photo of it on my trailer and after it was put in the shop. Right now, I’m in the process of repainting this beauty. So far, only one guide bearing needed replacing and the motor hummed like a champ. It has a 5hp 3 phase motor. 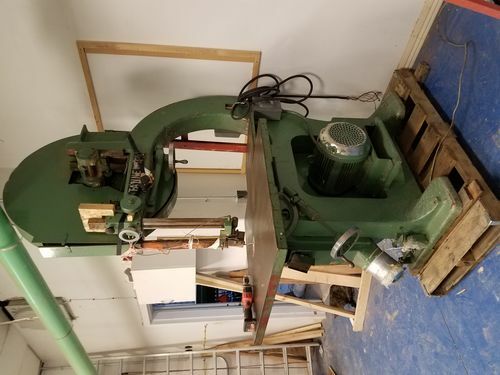 I am thinking I will more than likely get a sawmill blade for it as those companies are used to dealing with long blades. This one is a 19’ 6” blade. If I go to a standard sawmill company, the blade will cost me about a third of what I paid for this thing. That is a beast for sure. How’d ya get it off the flat bed? Well, color me jealous. Great score! I know it’s big but it’s still hard to tell the scale. I found this photo online – good Lord! AZWoody has painted it already since those pics. He’s had it like a week and it looks brand new. Not sure why he posted the old ones. I’m seriously jealous. If he wasn’t 2.5 hours away from me I would be parking cars in my garage and just spending all my weekends in his shop. 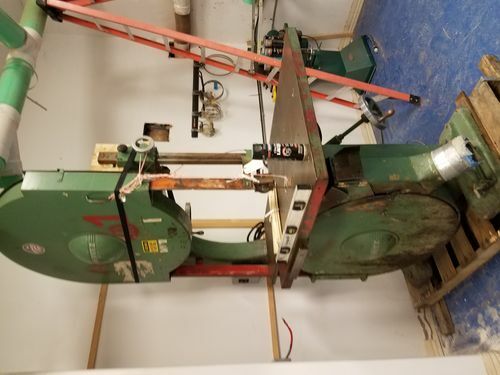 Wow that’s a cool band saw. Thanks for the links. I’ve been mulling that idea for a while now. Jacklewis from here has been telling me for a while I should do that. I guess I better start doing my research. AZWoody has painted it already since those pics. He s had it like a week and it looks brand new. Not sure why he posted the old ones. Sweet buddy! Congrats again! Definitely the last rip saw you’ll ever own/need. 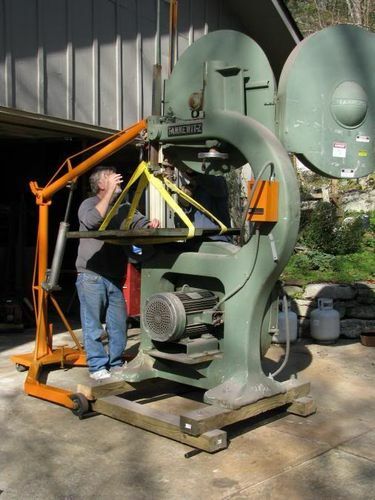 Now that’s a Bandsaw! Can’t wait for picture of it finished. Would like to see a video of it working. Looks like it should be finished put together today. Not a bad idea on a video. I’ll have to come up with a youtube video for that.